On this page we will take a look at the Philips Hp6576 which is regarded as the best Philips epilator, the goal of this review is to help you decide whether or not the Philips epilator is for you. There’s a lot of confusion around epilators and most reviews raise more questions then provide answers for their readers. That’s why we have a comprehensive review that covers all the important points so that nothing is missed about the Philips epilator and its features. The Philips Hp6576 is the top of the line epilator by Philips which is easily competing as one of the best epilators available today. Philips put a lot of technology within this epilator which just unleashes the tech geek within and ensures you get the best hair removing experience possible. The Philips Hp6576 also provides great value for money with all its great features as well as being one of the cheapest epilators on this list of best epilators of 2015 you can check out our list here. The Philips Hp6576 has 32 textured ceramic discs which allow the epilator to catch and grip even the finest strands of hair this ensures you get the best epilating experience which is not only effective but also efficient. This results in you getting a very quick epilating session. The Philips epilator also has a massage system that then soothes the skin by vibrating making the epilating process much easier and more importantly more pain free. The Philips Hp6576 also comes with 4 attachment heads which allow for more specialization and effectiveness in the hair removal process such as special attachments for trimming, shaving and even for extra close hair removal which provides smooth skin while providing safety to its users. The Philips epilator also has a removable head which is very useful this makes the clean up process very easy and ensure top quality hygiene. Many great epilators mess up here they forget about the users experience after they are done using the epilating. One of the first things you will notice about the Philips Hp6576 is that its head is wider than most epilators. I really liked this feature this allows the epilator to easily cover more area and to speed up the epilating process. The wider head is very similar to the one found on the Silk-Epil 9. This epilator is full of technology with the sole purpose of improving the epilating experience but we will get back to this a little later. The Philips epilator has 32 textured ceramic discs this was the first time I ever heard of these, I initially thought that this was a small amount because there are so many epilators in the market with twice the amount of tweezers. But these 32 discs provide its users with quality not quantity, what does this mean for you well you will be able to remove most hair in about one sweep of the area with this epilator rather than annoyingly running the epilator across the same spot. The ceramic discs are very effective at catching even the finest strands of hairs and ensuring they are not missed and this is good news because this means much faster epilating sessions for you. The Philips epilator is not very effective if you want to use it on the face. You can use it to remove some hair around the chin or even the upper lip area but it cannot and should not be used for precision jobs. We recommend you read our review of the best rated Facial Epilator. The Philips Hp6576 also has a very small pivoting head this helps when using the epilator in the hard to reach areas and speeds up the epilating process. I personally would have preferred a larger pivoting head rather than the very small pivot its able to do. I say this because the bigger pivoting ability would have added in much more flexibility in this already very effective epilator. The Philips epilator is just full of technology and when you read and learn about it you can’t help but smile if you’re a bit of a techno geek like me. The most common feature on the best epilators these days is having an integrated light and the Philips Hp6576 also has this. It’s very helpful to ensure you don’t miss any hair strands and get a complete epilating session. 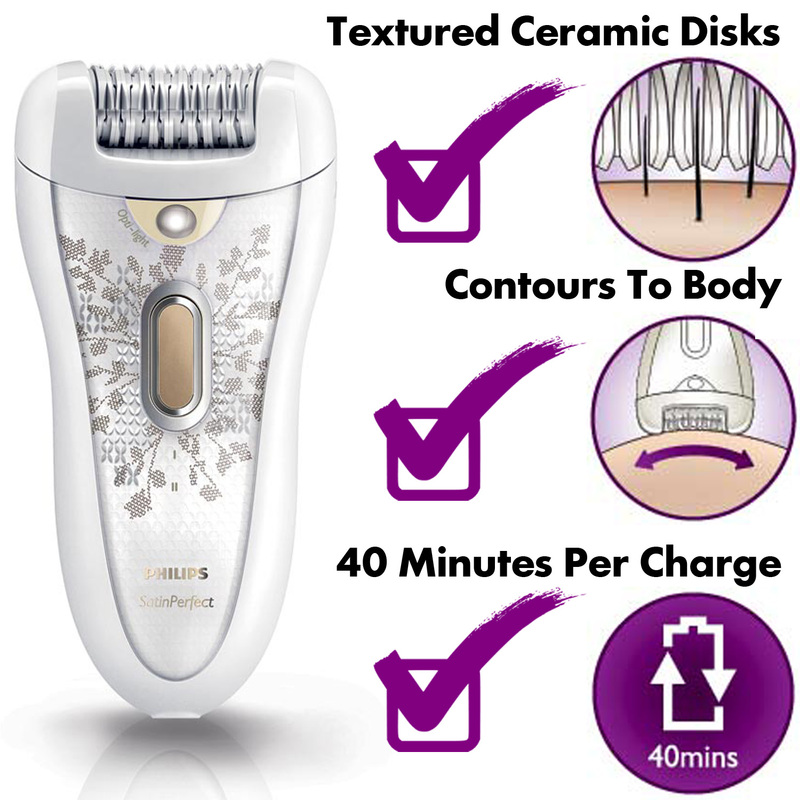 Now time for some uncommon technology, the Philips epilator has an “active hair lifter“ this makes the hair actually stand up so it’s easier for the epilator to catch and remove the hair strands direct from their roots. Our experts have tested this feature and it actually works as they advertise it to work and this greatly improves the epilating process and experience making it much faster. Another unique technology within the Philips epilator is the built in massage system which massages and soothes the skin where applied this helps to prepare the area and greatly reduces any pain associated with the epilating process. I really liked these features and hope that other companies will follow through and add features such as these in there epilators as well. The head is also removable this makes it very easy to clean up this epilator after your done using it just remove the head and run water over it. You can read some important epilator tips that can improve your next epilating experience in the following link click here. The Philips Hp6576 epilator is easily one of the most innovative epilators available today it’s packed full of technology to provide its users with the best epilating experience. The biggest downside of this epilator is that it’s not a “Wet and Dry” epilator so it can’t be used in the shower or the bath tub. If you’re looking for an innovative epilator which is packed full of technology that “actually works” and improves your epilating experience and is quite easy on your wallet then the Philips epilator can be for you.